Group E’s two European sides, France and Switzerland, kick off shortly, with the “American” sides Ecuador and Honduras meeting in the evening game. 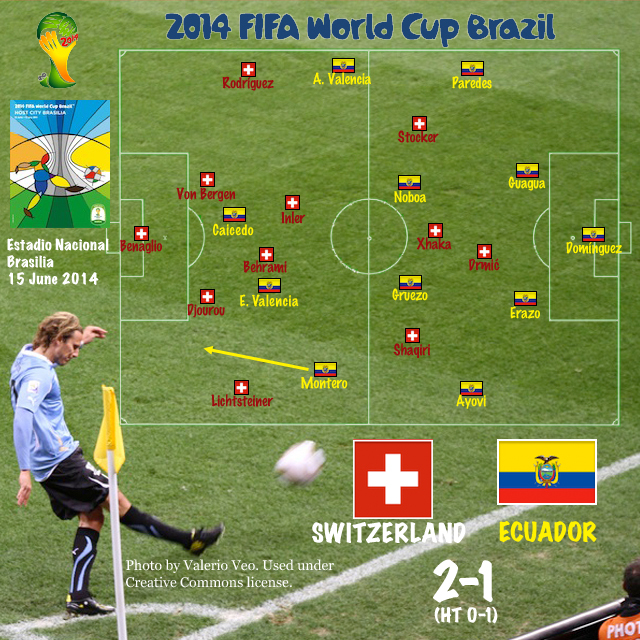 In anticipation, here are some thoughts on Switzerland – Ecuador. This game had an even more exciting finish than the United States – Ghana, and if you haven’t seen it yet you need to check out the highlights. Switzerland generally looked the better side, but it was a contest that could have gone either way, with two set piece goals and matching final-minute opportunities. Both sides will face sterner tests against France, and will look to get a job done against an inferior but extremely physical Honduras side. Switzerland was a side I largely ignored during qualification, writing them off as the beneficiaries of a soft group. That judgment may have been fair to the group, but Switzerland are a better team than I realized. Ottmar Hitzfeld uses a 4-2-3-1 built around a highly capable midfield. Neapolitan teammates Gökhan Inler and Valon Behrami provide defensive cover and deep distribution, with an attacking three of Xherdan Shaqiri, Valentin Stoker, and Granit Xhaka that, while all now dispersed with this summer’s sale of Stoker to Hertha Berlin, played together at Basel FC from 2010-2012. That’s a significant club connection amongst players of more than competent skills. Moreover, Michael Cox praised the Swiss center-backs in a team preview naming Switzerland the true dark horse of the tournament. Against Ecuador, Valon Behrami, Granit Xhaka, and Gökhan Inler were all excellent on the ball. Behrami controlled the middle of the pitch completing 67 of 80 passes, while Xhaka completed a striking 51 of 57 passes, almost half of those in the attacking third. Inler bridged the gap, with 55 of 69 passes completed. Behrami, of course, was also responsible for the remarkable tackle on Arroyo that kept Ecuador from a last-minute winner and spurred his team’s own dramatic victory. Bayern Munich’s Xherdan Shaqiri was also excellent, creating four chances and taking five shots. Less effective was Valentin Stocker, who has looked so impressive over the last two seasons for Basel FC but had virtually no impact in this game. It will be interesting to see if his second half replacement, Admir Mehmedi, is given the start against France, as he was much more lively (and, of course, scored Switzerland’s equalizing goal). Haris Seferović, too, was quite sharp in replacement of striker Josip Drmić, both setting up and finishing Switzerland’s remarkable game-winning goal. It remains to be seen whether that will earn him a starting spot, or if he will continue to provide late danger as a substitute. Ecuador use a balanced though asymmetrical 4-4-2: while Manchester United’s Antonio Valencia is a traditional, touchline winger, Jefferson Montero (and his 76′ substitute, Joao Rojas) are more likely to drive inside toward goal, either to score or create. They will need both to be in top form against France in their final game in the group to have any hope of advancing after losing this must-tie-or-win game in its final seconds. The good news, such as it is, is that Jefferson Montero was probably the best player for either team. He created the free kick that led to Ecuador’s first goal and was generally the most exciting individual performer until his substitution. Less impressive was Antonio Valencia, who created Ecuador’s own chance to steal the game in the final minute but was otherwise fairly quiet (3 crosses, only 1 completed). He will need to connect with the in-form Enner Valencia (no relation) to give Ecuador an alternate route to scoring. Another player to consider is Michael Arroyo, who replaced Felipe Caicedo and played behind Enner Valencia. Because he was unable to finish off the last minute chance created by Antonio Valencia, allowing Behrami to come away with the ball and start Switzerland’s game-winning attack, he will likely have a difficult time entering the starting XI at this point. Michael Cox, however, noted his second half performance against England in a pre-Cup friendly, operating in the center of a 4-2-3-1, as a potential way for Ecuador to bolster their midfield control. Perhaps a strong second half performance against Honduras, should Arroyo get the opportunity, would clear the way for a larger role against France, where midfield possession will be even more at issue. Finally, some mention must be made of Chucho Benítez, the former Club América striker who was the heart and soul of this Ecuador side before his unexpected death last year. That tragedy is motivating the side, but it also leaves a major hole for them on the pitch. Ecuador will have to be at the top of their game, and also receive significant help from France, if they are to advance.